So, as of last week my Prospectus was officially all signed by committee, my department head, and now by the head of the graduate school. So, even though I have already been working under the precepts that it would be accepted for over two months, now it is official official and I have a nice letter from the graduate school declaring that “Critically Understanding Inspired Emulation: Seeing the Man of Steel as a Rhetorical Model of American Arête” is a definite and approved TWU Doctoral Dissertation topic. Now, all that being said, getting this thing off the ground the last 2+ months was not an easy trick. For starters, there was the rush at the end of the semester (grading and what not) then holidays where my wife and I were traveling, and then there was cleaning up at the house and rearranging to prep for our own little blessing from Krypton arriving this summer. So, lots of preparation and planning that through a wrench into acting on the writing process itself. Another element that got in the way of moving forward was: where to start? Now, I know that should be an easy answer, “duh, at the beginning.” However, I knew what and how I wanted to start but my problem developed from the fear, one born out during my prospectus process, of myself becoming repetitive and overstating things (as I do when I teach). This left me at a big impasse, not to mention figuring out how and when to do my work, that I let build and build from a Hobbit hole sized issue into the Lonely Mountain itself with me desperately looking for the keyhole on the last light of Durin’s Day (yes, I saw the Hobbit 2 over the holidays). This left me with what looked like one hell of a climb, so, I did the smart thing and turned to the sage advice of my dissertation director. So, the answer of moonlight came in the notion that a non-linear approach might serve me best and allow me to work directly on the area in my project I felt most comfortable and eager to engage: the Analysis Chapters. Specifically, I took from the example in my prospectus and applied myself to looking at Analysis Ch. 3 containing an examination of All-Star Superman. Grant Morrison and Frank Quitely’s mythic and grand Superman narrative was what had created my own light bulb moment some years back and when I took note of it, it was that “duh” moment I had been searching for all along. All of sudden, a flood of ideas and information came pouring out of my head. I knew I wanted to look at All-Star Superman, Superman Birthright (Mark Waid and Leinil Francis Yu) and Superman: Secret Origin (Geoff Johns and Gary Frank), but what did not expect was the torrent that I had unleashed. I am not kidding when I say ideas came rushing out. I found myself attempting to limit myself to three examples from each and in that process I discovered the three primary points I wanted to make. For one, I specifically had chosen this analysis chapter to look at Bakhtinian theory surrounding the application of re-accentuation in the Superman narrative because the works here lent themselves quite specifically to that point. 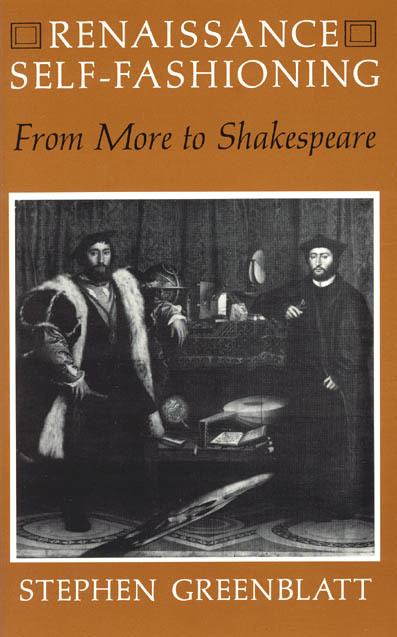 What ultimately came pouring out though lead to explorations of the identification (Burke), Aristotle’s points of noble virtue, and connections between ideas of self-fashioning (Greenblatt) and the model/anti-model idea of Perelman and Olbrechts-Tyteca. 1.Specifically attempt to re-accentuate a classic element, image, or aspect of Superman’s iconography. 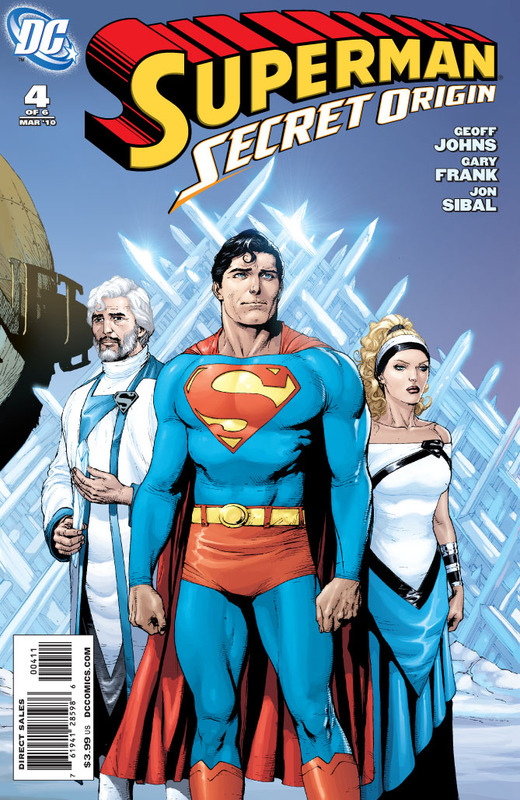 In the case of Superman: Secret Origin, this fell to looking at Superman: The Movie and Christopher Reeves. 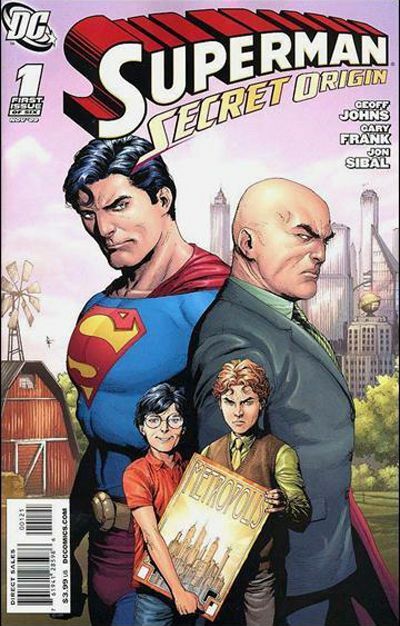 2.Make a specific illustration of the model and anti-model relationship, particularly and defined in all three by the relationship of Clark Kent/Superman and Lex Luthor. 3.Look for and illustrate Superman’s ability to embody Weldon’s concepts of the basic Superman characteristics – help others and never give up – as found in the sources as ways to which Superman inspires those both within and without the narrative. Along the way, I had to add to this chapter and discuss the ramifications of these two audience perspectives along with the notion of how retrocontinuity or retcon functioned as a point within these three narratives I was examining. So, altogether I have birthed a Leviathan and I hope I can survive it. It will need revision and there is already a mountain of material I am starting to compile, not to mention visually mapping it out afterwards. Particularly, I need to investigate just how the external and internal audiences function. Ultimately, what I am aiming to do, to keep myself poised on at all times, is the understanding of my central question: How does Superman maintain and enhance rhetorical persuasion? What is it about him that allows him to be as persuasive as he is? So, now we move on to revision and more drafting. The next frontier lies with Analysis Ch. 2 and attempting the first major attempts to re-invent Superman and alter his narrative in order to update the changes in his identification and conceptions of virtue culturally (John Byrne’s Man of Steel). This will look at reinvention and exploration of Superman’s narrative when taken to extreme limits and appropriations in Superman: Red Son and Kingdom Come and what this reveals. The reality at work here is that the idea of re-accentuation distance between an original incarnation of a concept from what it is now that it is applied. 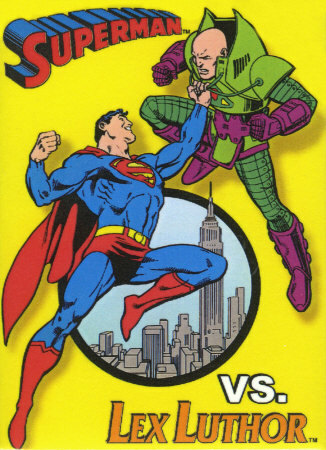 To think upon this with regards to Superman: if Superman is a conceptual embodiment is an embodiment of classical arête then one must acknowledge that time has put distance between what arête was for ancient Greeks (it even evolved for them) and what Superman has come to represent based on the application of such ideas when conceived Jerry Siegel and Joe Shuster. Bakhtin speaks of “emit[ing] bright new rays” and that under changed condition something like classical Greek arête may lose its original meaning based on its fixed and “anachronous” ideas, but this does not prevent the idea of virtue, of arête, from being extinguished completely, but may require a form of constant revision and reinvention instead. Now, retcon (short for retrocontinuity) is something more familiar for the comic book fan and audience. Searching for a definition, I decided to not use the Wikipedia entry and chose to go with the Oxford English Dictionary online version instead. They define it as a noun and verb, as a noun, it is commonly seen as “a piece of new information that imposes a different interpretation on previously described events, typically used to facilitate a dramatic plot shift or account for an inconsistency” (oxforddictionaries.com). Basically, its something done or inserted in order to generate a change or revision of previous material, often to make it fresh or to correct some kind of error in continuity. This ties into it as a verb, where it is defined as being a form of revision, revision that is done “retrospectively,” by asserting its definition given for being a noun” (oxforddictionaries.com). Now, here is where I am going with this: an example of a bit of retcon and a bit of internal re-accentuation of Superman. This is a re-accentuation as facilitated via retrocontinuity. I am a big fan of Grant Morrison as a writer, and Frank Quitely as an artist, and a really big fan of their collaborations, particularly their 12-issue self-contained epic of All-Star Superman. Particularly, there is a page where Superman saves a young girl from killing herself; however, he does it in perhaps not the most “expected” of ways. He saves here by imparting to her an inner strength she already has but by functioning as a model, an outward manifestation of that inner strength. It is a brilliant page and perhaps my favorite moment in comic books of all time, definitely it is what I feel is the “essence” of Superman. So, what is all this to do with re-accentuation and retrocontinuity (retcon)? Well, it is worth noting that this page I admire so very much plays upon a similar premise to one found in one of Superman’s earliest adventures. 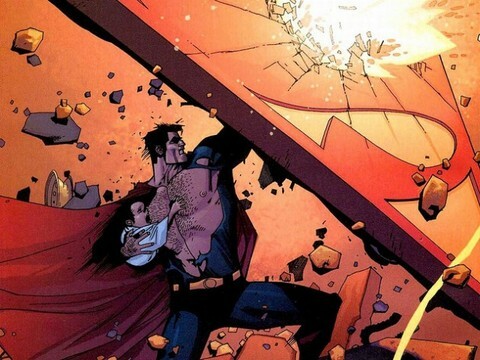 In Action Comics #9, entitled “Superman: Wanted,” there is another such scene of Superman saving someone who exhibits suicidal thoughts. Now, unlike the depiction in All-Star Superman, and roughly seven decades later, this version of Superman catches a man after he has jumped and just in time before he meets an unfortunate end with the pavement below. Even more striking is the juxtaposition of these two similar but differently accentuated depictions of Superman’s powers. 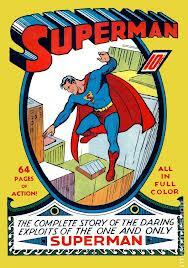 To begin, the Superman found in Action Comics #9 (February 1939) is a character in his own infancy but one who is also aimed more directly towards an audience of kids. He is appearing in a title billed to be full of “action” and his stories, written and drawn by his creators Jerry Siegel and Joe Shuster, speaks in direct, overt language and actions that leave no mystery to what he is out to do – save people’s lives. This kind of character works for the audience he is aimed at, but what happens to characters like Superman after decades of time and changes in the audience. Well, that is where retconing becomes important. Its through retconing characters that they are kept viable. They need to be reinvented and Superman has had plenty of them himself – most recently the New 52. 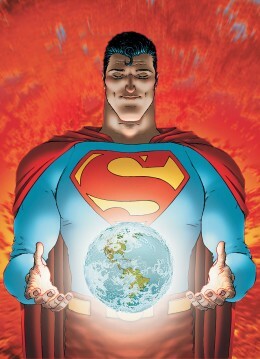 Morrison and Quitely’s depiction in All-Star Superman (though technically separate from the normal continuity) is no exception. Morrison and Quitely are performing their own grand style, epic retcon of Superman. 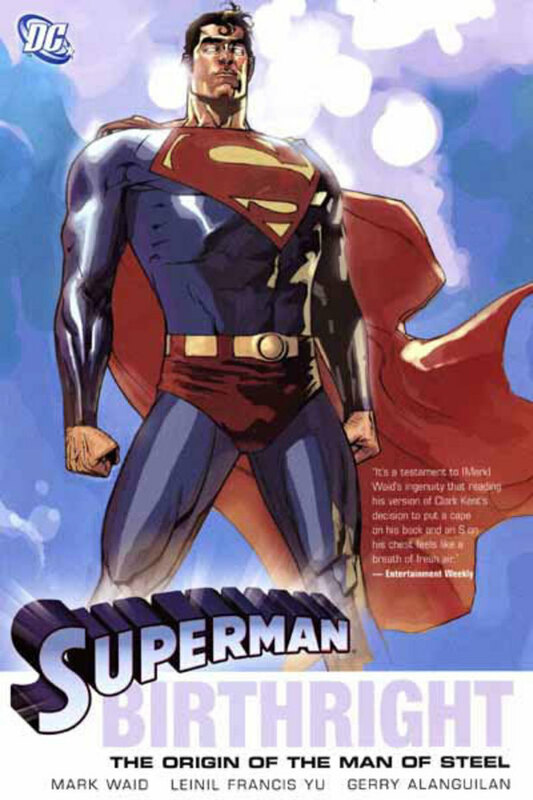 This maxi-series brings together many different and divergent elements of Superman’s seven decades of history in order for Morrison and Quitely to spin together a magnificent story of Superman facing his own mortality and the choice he makes in the face of death: to continue doing what he always does, save the day. 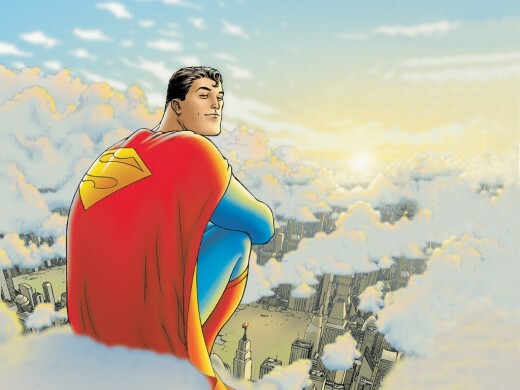 Superman does not abandon his own ethos, in fact, Morrison and Quitely are able to in fact draw out and highlight, relying on Superman’s own complicated and previously retconed universe, the essence of Superman, distilled into a 12-issue series. What Morrison and Quitely masterfully are doing is re-accentuating chosen elements of Superman’s continuity and developing their own compressed (and separate) retcon of his very essence and displaying it. 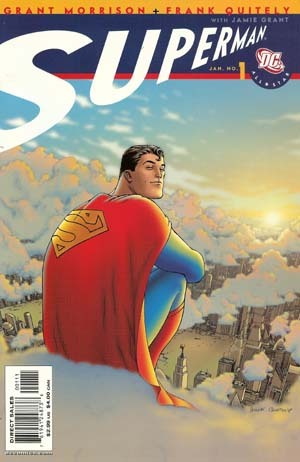 If one examines Superman from the Action Comics #9 story with that in All-Star Superman (issue #10) what is revealed is essentially the same character, just different levels of complexity that reveal the evolution of his audience over the decades and the complications/tensions/ expanded abilities of Superman himself. First, there is the depiction and evolution of mental illness on display. The man who jumps in Action Comics #9 is seem to be outside the window of a sanatorium or mental hospital. This implies overtones of how mental illness was seen, though we are not told how serious his condition was, to be something of a dangerous social stigma. This contrasts with the girl in All-Star Superman #10 who is obviously in a form out-patient care of a psychiatrist, and appears to suffer from depression, to which Superman appears both sympathetic to but also acknowledging a far more common and slightly-less stigmatized view in turn. Second, and most importantly, in the original story Superman catches the mental patient after he has jumped (Action Comics #9) while this young woman he helps before she attempts suicide and jumps (All-Star Superman #10). Most interesting here is the contrasting of overt vs. covert, explicit vs. implicit powers concerning Superman. In the former, Superman demonstrates his powers openly and without any particular complication or sub-text, no message to pass on other than “someone” might save you too. The later is more powerful because of its complexity. This is an evolved Superman who is able, through the comic book medium, to express more implicit and inspirational powers rather than the traditional overt ones. It is a masterful encapsulation and reveal of the essence of Superman, an essence that existed even in the Action Comics #9 of 1939. The beauty of this is just how complex and complicated superheroes really have the power to be along with the acknowledgment that they are not static creations, but rather ever-evolving, continually retconed characters who have the power to accentuate or re-accentuate elements of the real world through “living myths” that convey and communicate deeper needs and truths. Morrison, Grant and Frank Quitely. All-Star Superman. New York: DC Comics, 2010. Print. “Retcon.” Oxford Dictionaries. Oxforddictionaries.com. 22 Nov. 2013. York: DC Comics, 2006. Print. In a recent Q&A with Zack Snyder, Michael Shannon (Gen. Zod), Henry Cavill (Superman), and Amy Adams (Lois Lane) on Yahoo hosted by Kevin Smith, a young woman asks “why have Superman kill” when it goes against the common assumption? Snyder and Shannon address this issue and question, but not as directly as say, someone like me, would want. This is where I feel like he goes off track for me … in a big way. Now, I am not disputing this kind of particular interpretation of Superman. Part of me completely understands and accepts the rights of filmmakers to bring their own interpretation to characters. However, I have some problems with his justification he puts forth here. First, I can accept the idea that the idea of Superman “not killing” as being popularized by his depictions in radio, television, and movies over the last the years. I am perfectly willing to accept this idea, however, I disagree with the notion that the “rule” does not exist in the comic books. I disagree not on any particular grounds – since Snyder offers up no real examples of Superman basically committing justifiable homicide in order to be practical – but Snyder appears to be exploiting a lack of a “letter” of the rule to the “spirit” of the rule that has existed in Superman since his earliest conceptions in modern comic book mythos. 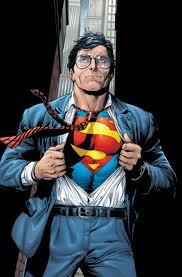 Superman, as a character, was created to embody the paradigm of human ability and spirit. The idea that such a paradigm would intentionally kill represents a rather poor critique of humanity I feel. Superman may have not saved those who were his enemies, but Superman’s ethos lies in his ability, because he has extraordinary abilities, to find better ways than killing – this is part of his “spirit. Superheroes who “kill” stop being superheroes and become vigilantes instead. Now, it is obvious and Snyder admits that they intentionally forced Superman into a situation where it was Zod or the innocent family. When they did this though, I feel, they are attempting to apply modern, post-9/11 zeitgeist incorrectly upon a character in order to force identification with an audience. 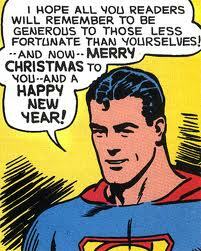 However, this forced identification with the audience in fact poisons the well for what Superman stands for. It poisons his ability to inspire by forcing him into a moment of human weakness. Now, what I just said: “It poisons his ability to inspire by forcing him into a moment of human weakness” is not meant to say that I do not think one can depict Superman in this manner if it is what is needed – and from some I have spoken to, it worked – to have modern young people really identify with Superman. This Superman is a reflection it brings to our modern world. However, I am put off by the shallow attempt that Snyder made to deflect such a depiction by using the comic book medium that spawned Superman as his weak defense. Michael Shannon noted that, as he saw it, he was not surprised that Superman had to kill Zod and he did not see why people took issue with it. Snyder then notes, as pointed out above, that he sees Superman as a “‘practical’ hero.” Its not surprising to me that he calls Superman a “hero” and not a superhero because the version he has created is no longer really “super” because of the interpretation he has undertaken. He continues by noting that Superman looks for solutions and this was the only one available to him. Again, I take issue that this is a mishandling of Superman as a character. This is lowering of what he can be. I understand the need to do this in a practical sense, but Superman is not a “‘practical’ hero” as Snyder notes, he is something far far more than that. Superman, in the comic books, is a character with many layers and dimensions. Comic book continuity has been twisted and turned, rewritten and evolved in ways where the mere navigation of it is less like taking a ride down the Mississippi River as it is navigating rivers and rapids of the entire United States in order to get from the Atlantic to the Pacific Ocean – a trying and difficult undertaking. To simply skate over the justification Snyder makes by deflecting at the comic books feels rather insulting and demeaning to the comic book medium itself. This is the heart of my problem with his statement – the arrogance of it. Without those lowly “comic book creators,” those bullied boys from Cleveland, Ohio who dreamed up Superman, Snyder would not have the material he has to work with. I want to think he has more respect for the comic book medium, but his rather passé answer does leave me with that impression. Many comic book writers, among them Mark Waid (who know Superman as a character far better than Snyder), have had problems with this ending. If Snyder wanted to make a better case, simply making what felt like a lazy deflection to complicated comic book continuity was not a well thought out choice. Superman, the spirit and essence of him, is not some simple plot device that when you find it difficult to utilize you short curcit the situation in order to make it play “your way.” If you want to deal with the character then you need to understand what the character is and what it can be. You are playing with the raw material, the mythos and essence of culture and ideals – take a bit more care before you use it like some kind of supped up wrecking ball Snyder. Now, Snyder hinted at elements, ones he should have lead with, that these actions demonstrated by Superman in Man of Steel will have repurcussions. The article notes that “Snyder also hinted at the possibility of Kal-El facing the repercussions of taking Zod’s life in the next film” and I’ll be curious to see what he comes up with (“11 Super Things We Learned…”). Ultimately, this all flows down to the fact that many times those who are appropriating characters like Superman are doing so without really and strongly reaching an understanding of the character and what it was that both created them and has allowed them to endure. Failing to do this and then appearing dismissive to those forces really does not help one appear to be the kind of stewart I can feel confident in having control over such an iconic character. Enk, Bryan “11 Super Things We Learned from the ‘Man of Steel’ Live Fan Q&A Event” Movies Blog. Yahoo.com. 9 Nov 2013. Web. 10 Nov 2013. Why not? He is the modern manifestation of America, of modern myth. He is one particular interpretation for what America can be for the rest of the world, and in this world’s current state of the world and United States today, it seems to be something even more relevant than ever. Of course, there is more to this answer. This is just a start. 2.Why use the theorist you are using? 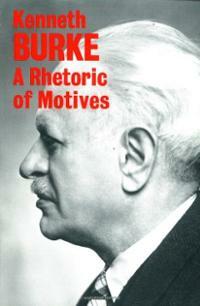 The rhetorical role model is persuasive because it is self-fashioned to a form we (as a society) can identify with – both as an ideal (Superman) and as an everyman (Clark Kent) – and this identification allows the persuasion of the model to take hold and promote, inspired emulation, cooperation as found as part of Burke’s definition of rhetoric. The dialogic and reaccentuation element develops via aspects that Superman and how he is connected to American culture and American culture is turn influenced/shapes Superman the character – it helps determine parts of the self-fashioning and choices that make Superman identifiable. Part of what of the achievement that also aids Superman in his identification comes from the ability also of the character to tap into reaccentuated, appropriated, identifiable elements of myth and heroism that are embodied in Superman. 3.What is my major argument? I think I may have just found what I really REALLY want to be as part of my opening introduction to my dissertation. In the opening segment of the October 19, 2013 episode of the NPR program “This American Life,” John Hodgman discussed a choice in superpowers. The debate surrounds a choice between the powers of flight versus that of invisibility. In the closing of segment, Hodgman summed up the discussion with a question by acknowledging he himself has trouble choosing and that it boils down to a question of choice: “who do you want to be? The person you hope to be or the person you fear you actually are? This, for me, was a seriously compelling moment. Superman flies. Superman goes without a mask; he acts with nobility and openness – exposed. This would not be everyone’s choice, but Superman does this because he is a hero – a superhero. Superman is the modern embodiment of the person who we all hope or want to be. That is what makes him, like all superheroes, different from you and me. 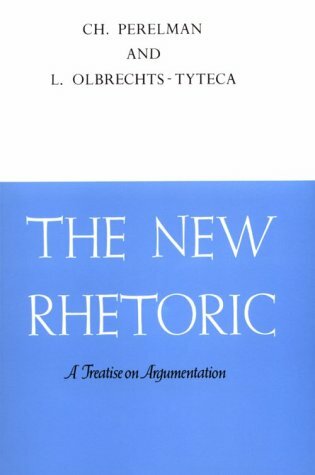 This ideal of who we want to be, of inspiration and emulation that helps conform Superman so perfectly to Chaim Perelman and L. Olbrechts-Tyteca’s notion of a rhetorical model as laid out in their work The New Rhetoric. In Ch. 3 of The New Rhetoric, titled “The Relations Establishing the Structure of Reality” and part of the first section noted as “Establishment Through the Particular Case,” Perelman and Olbrechts-Tyteca define what a model (by their definition) is for them. They define it as, that “In the realm of conduct, particular behavior may serve, not only to establish or illustrate a general rule, but also to incite to an action inspired by it” (362). This is definition of the model is something or someone that establishes a rule or code of conduct that then generates some kind of imitation inspired by it. Say, for example, one applies Superman just to this initial example of the “model,” one can point out that on one level Superman is the template for all modern comic book superheroes. His creation, abilities, and conduct serve as the original template for all subsequent superheroes that followed, from Batman to Captain America, Spiderman to the Justice League. On another level, Superman, within in his own universe within the comic books established a model for how other heroes wanted to behave, he wrote the rules, and he served as the guarantee for the maintaining of those rules as well. One could argue that Superman, as a “model,” would fall within the area where “imitative behavior” acts as part of a “rule of justice” (363). This rule is itself based on the fact that Superman acts as the guarantee of the model, of the conduct of a superhero through his prestige. It is through his recognizable standing that Superman is also able to portray and project the status of a model. His “prestige confers added value on [his] acts” and allows those acts themselves to become models for other superhero creators and superheroes creators to emulate (363). Take for instance, and Michael Chabon notes this in his novel (Amazing Adventures of Kavilier and Clay) that recounts fictional comic book creators operating around the same time as Superman’s creation, that Superman himself spawned many a copycat and still does. Superheroes such as Captain Marvel (Fawcett Comics), Hyperion and Sentry (Marvel Comics), and more recently Mark Millar’s Superior (Marvel Comics) and Utopian (Image Comics) are just a few of the many Superman analogues that have appeared over the past 75-years. Each of these analogues is, of themselves, homage to Superman and the power of the idea of that model. Superman’s nature as a superhero in his own comic presents inspired actions that model for other heroes the kind of behavior that, in fact, defines what a superhero is suppose to do and act like. Superman is an illustration. For, it is the “model shows what behavior to follow, and serves as a guarantee for an adopted behavior” and for this service, they are burdened with “an obligation which more often than not will determine his behavior” (364). One can see that the superhero, like Superman, is confined within a box. This box, to be the model, requires not only inspired action worthy of emulation, but can be seen as “imprisoning” the superhero in a position of extreme responsibility. It is a bit like Spiderman and Stan Lee’s wonderful line: “with great power comes great responsibility” magnified exponentially. It is fortunate then that Superman has chosen this mantel and is in fact able to project those qualities worthy of a model, but somewhere, on some meta-personal level, one might find it really hard to truly envy a life more inundated that any modern celebrity. Ultimately, and perhaps thankfully, Superman is fictional. However, just because he is fictional does not render the power of him as a model inert. In fact, like any other fictional character, Superman’s popularity has transcended many mediums and has served, interpreted, as a kind modern mythical figure – paradigm – of human potential. He is the thing, to return to John Hodgman’s segment from “This American Life”: the person we hope to be. So, after a meeting of the a group of my fellow Doctoral Candidates and Dissertation workers – our shared major professor has playfully dubbed us the Justice League of Rhetoric (love it) – I was returning home and Hans Zimmer’s soundtrack to the new Man of Steel movie came up in my iPod. While I listened, I began to ponder some questions that had been posed to me. First, before I jump into the questions, as a matter of focus, and this will come out in more clarity as I finalize Dissertation Prospectus 4.0, I have decided that focusing on the Superman in the comic book medium and how that medium, more so than television and movies, can adapt and shift with the cultural zeitgeist. I believe this will let me stay closer to my comfort zone and help focus my own research into something that can avoid taking a tangent into something sprawling and crazy. Since I am focusing on Superman as a rhetorical model, it occurred to me, and was brought to my attention by the League, that there emerges a blemish to the “model” when you think about Superman and his secret identity from the point of view that this could be viewed, though it is done to protect those he loves, as lying or deceit. It is a tricky question and swings one into discussions of ethical morality (deontological vs. utilitarian) notions of doing the right thing or doing what has the better consequences. I get this, but what fascinated me more though was the reality that perhaps we often look at this TOO much from the point of view of adults. What about a child’s point of view on Superman’s secret identity? What if instead of focusing on Superman’s need for lying and concealment of his secret identity is less an adult utilitarian choice, and perhaps channeling Mark Miller’s allegorical/analogical representation in Superior, we see the choice of Superman as wish fulfillment. What if we look at it from the child point of view and the notion that a lot of children, but especially those who have suffered loss or pain or heartache for whatever reason often “wish” for an escape, to be someone else, who can make that loss or pain or heartache go away. Superman is that “wish.” He is that something beyond that kids can look to and think, if he can do it, so can I. He is something worth aspiring to imitate, perhaps not in superpowers and abilities (because that is where Fredrick Wertham would chide me as putting nonsense in a child’s head or tempting them to do things that are dangerous), behavior, character, and decision making – doing what is right and good. It is a desire in a child to be extraordinary. Superman can and does show a “model” for how one can, even as a “mere mortal” operate by a code that helps promote a better world. In addition to that thought, listening to the soundtrack also provoked ideas about Superman and his “relevance” in our world. Superman embodies the very best of American idealism, and even more importantly, he represents the very best of humanity too. Ultimately, Superman embodies also the child-like belief that everything, anything, is possible. Nothing is impossible. He shows each new generation that there is a chance to be better than the one before, to start over or even more to build something better than what was before.